Packed with professional-level features, the Vigor 2860 series offers truly comprehensive DSL connectivity and security. Compatible with all UK variants of ADSL (including ADSL2+ and Annex M), VDSL and VDSL2, the Vigor 2860 can also be used for cable-modem, leased line and EFM applications using its Gigabit Ethernet WAN port. You can also add a 3G/4G/LTE cellular modem for wireless WAN connectitivity to supplement your fixed line connection(s) or as your primary connectivity. The Vigor 2860Ln version has the 3G/4G built-in so no extra USB modem is needed. A 6-port Gigabit Ethernet switch on the LAN side provides high speed connectivity for your server, other local PCs or for uplink to a larger Ethernet switch. Comprehensive security features include content filtering, web application controls and an object based firewall management system. The Vigor 2860's built in DSL interface will connect to either an ADSL or VDSL line. 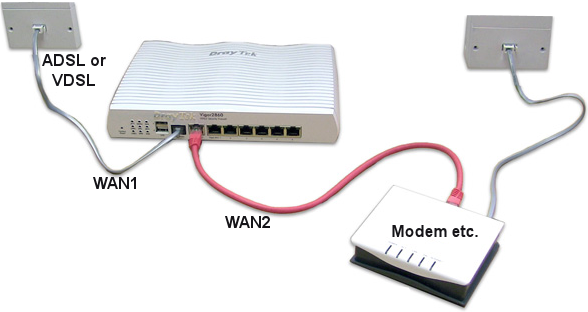 If you have a second line (of either type) you can add an additional modem (or your existing modem from your other line) to the Vigor 2860's Ethernet WAN ports. You can set the two lines up in load balancing mode, where traffic is split across both of them, or into failover mode, where the other DSL line only kicks-in if your primary DSL line fails (or vice versa). ADSL makes a particularly good method of failover for VDSL because they are delivered differently. VDSL service is provided and powered by a cabinet in your street - that's where the line terminates. ADSL service, on the other hand, comes all the way from your local exchange, which coul be miles away and is powered from there. That means that if your street's VDSL cabinet is damaged, its DSLAM fails or you lose power to your street, you lose VDSL, but your ADSL line comes via a different method and route, so it's less likely that both would be affected. These failover methods can also be used instead for the other WAN ports on the router (Ethernet or 3G). Security is always taken seriously with DrayTek routers. The firewall protects against attacks including DoS (Denial of Service) attacks, IP-based attacks and access by unauthorised remote systems. Wireless, Ethernet and VPN are also protected by various protection systems. The latest ('Version 3') DrayTek object-based firewall allows even more setup flexibility than ever, enabling you to create combinations of users, rules and restrictions to suit multi-departmental organisations. The Vigor 2860 now also allows selective direction firewall rules of LAN to WAN, WAN to LAN or LAN to VPN. In addition, QoS (Quality of Service Assurance) can now be selectively applied to specific users. The Vigor 2860 supports IPv6 - the successor to the current IPv4 addressing system that has been used since the Internet was first created. IPv4 address space is full up and IPv6 allows for much more efficient routing and a larger address space. IPv6 is supported both from your own ISP, but if your ISP does not (yet) support IPv6, the Vigor 2860 also supports IPv6 broker/tunnel services to provide IPv6 access using either TSPC or AICCU via 3rd party IPv6 providers. The content control features of the Vigor 2860 allows you to set restrictions on web site access, blocking download of certain file or data types, blocking specific web sites with whitelists or blacklists, blocking IM/P2P applications or other potentially harmful or wasteful content. Restrictions can be per user, per PC or universal. Using DrayTek's GlobalView service, you can block whole categories of web sites (e.g. gambling, adult sites etc. ), subject to an annual subscription to the Globalview service, which is continuously updated with new or changed site categorisations or sites which have become compromised (such as infected with Malware). A free 30-day trial is included with your new router. The Vigor 2860 features three methods of WAN connectivity - ADSL/VDSL, Ethernet (Gigabit, switchable with LAN6) and a USB port for connection of a 3G modem. The Ethernet port can connect to a second ADSL modem (e.g. Vigor 120), a cable modem or any other Ethernet-based Internet feed. The multiple WAN interfaces can be used either for WAN-Backup or load balancing. Load-balancing or failover supports IPv4 only currently. The USB port provides Internet connectivity (main, backup or load balanced) by connecting to a compatible USB modem (or cellphone) for access to the high speed 3G/4G/LTE cellular networks from UK providers such as Vodafone, O2, 3 and EE. If you don't have DSL at all, the USB/3G/4G access method can be used as your primary/only Internet connection, ideal for temporary locations, mobile applications or where broadband access is not available. Alternatively, if you will be making more regular use of 3G/4G/LTE, consider the Vigor 2860Ln model with its built-in cellular modem & SIM slot. The Vigor 2860 has built-in user management which allows you to provide conditional internet access to different users based on their own unique login (stored in the router, or on an external Radius server). The Vigor 2860 features a hugely flexible VLAN system. Each of the six Gigabit LAN ports can be isolated from each other, for example to feed different companies or departments but keeping their local traffic completely separated. The RM1 Rackmount Bracket enables you to fit any Vigor 2860 series router into a standard 19" rack or cabinet. The bracket takes up one rack slot (1U) and includes a cable retainer at the back to keep the power cord captive. The front mounted sockets of the router remain fully accessible. For wireless models, we then recommend extension aerials (or aerial extensions). 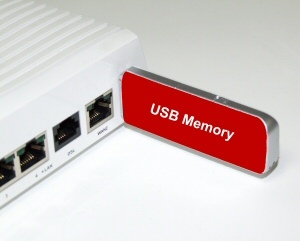 The Vigor 2860's USB port can also be used to add storage memory to the unit in the form of a USB memory key (as shown right). The Vigor 2860 then provides FTP access file uploading/downloading which can be from the local LAN or from anywhere on the Internet - ideal for a simple to deploy file depository. Access can be 'public' or using usernames and passwords, each of which can have their own directories and/or file access rights. As well as FTP, file sharing is available as a Windows 'network drive'. You can also use Windows Explorer to view and access the contents of the USB drive. If you do have a USB memory key connected, you can also have the router save it's system logs (syslog) to that memory instead of to a connecting computer; useful for technical personnel (SysAdmins). The NAS facility uses any FAT32 formatted device and provides a transfer rate of 12Mb/s.